Jessica lost her 5-year-old daughter Beth in a playground accident seventeen years earlier. She's never really come to terms with what happened despite moving on with life and starting a new family. But now her past has come back to haunt her. Someone's determined to make her suffer and Jess is convinced it's connected to events from all those years ago. When weird things begin to happen in her home, Jess realises someone is out to make her pay for past mistakes. 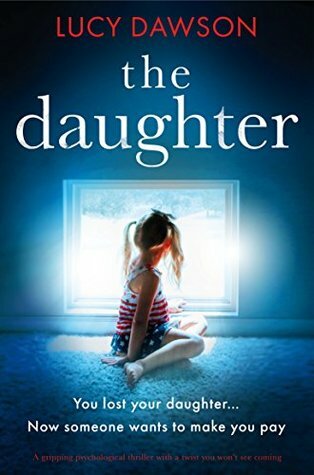 I thought The Daughter was an excellent psychological thriller. It had me so engrossed I really didn't want to put it down. There were plenty of wonderful twists and turns; just when I thought I had it all figured out, another spanner was thrown into the works - brilliant! Exactly the sort of book I love to read. Jessica's loss of her daughter was expressed beautifully and handled with great sensitivity. It was simply heartbreaking. What more can I say? An excellent plot with a spectacular ending. Buy the book, sit back and be prepared to be chilled and thrilled! I received an Advance Reader Copy. My thanks to NetGalley, Lucy Dawson and Bookouture. I'm addicted to writing about the extraordinary things that can happen to ordinary people - I like stories that jump in at the deep end, with a gasp. When readers take the time out to let me know they've stayed up all night because they couldn't put the book down, it makes my day. I really enjoy catching up with readers and always reply to emails. You can reach me at lucy@lucydawsonbooks.com. I’m also on Twitter @lucydawsonbooks and have a Facebook page at lucydawsonbooks. Alternatively you can download a free short story of mine at www.lucydawsonbooks.com or if you want to look at a lot of pictures of the beach and books that I'm reading, find me on Instagram at lucydawsonbooks.